I wash dishes like this so often, I forget how it must look to a guest hanging out in my kitchen. What? It’s the best way to do dishes. Two left handed gloves, one on each hand, two different colors. Sometimes, on a day I feel wild and crazy, I’ll switch the gloves around, putting the blue one on my right hand and the purple one on my left. Y’all, doing dishes is never boring at my house – I’ll tell you that right now. 1. Never worry about what people think about you when you’re washing dishes. Two lefthanded gloves of different colors worn at the same time? Why, we can establish a new dishwashing trend. 2. 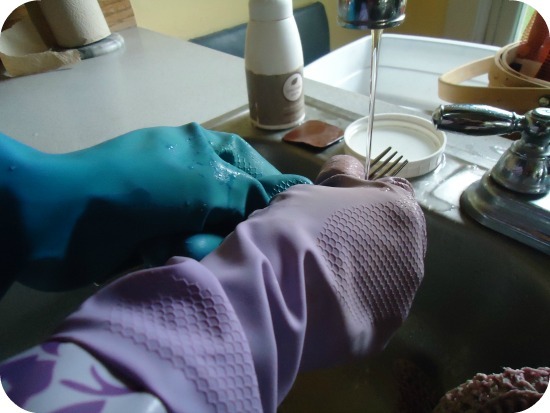 If you use rubber gloves to wash dishes and one of the gloves gets a hole in it, save the glove that doesn’t have a hole. Eventually, you can use it with another glove that has lost its mate. You’ll save a lot of money doing this. And I believe we’ve already established how cool you will look…not that we care what other people think. In practicing this, sometimes my mismatched gloves end up being the same color. Sometimes I actually end up with a left-handed and a right-handed pair of misfits. But more often than not, I end up with two left-handed gloves of different colors. It matters not. They still work just fine. And that, my friends, is my very helpful, money-saving homemaking tip for you today. P.S. This money-saving method does not apply to shoes or contact lenses. Lol, too funny. I hate wearing gloves to wash dishes, my hands get claustrophobic. And I can do that with my contact lenses, thankfully, as they are both the same prescription. I’ve had to do it more than once! I can count on you to be sensible… and make me smile. I especially enjoyed your “P.S.” Too funny! I’ve been doing this for a couple of years now. I just couldn’t stand throwing away a perfectly good rubber glove just because the mate is shot. For me it is ALWAYS the right-handed glove that goes first so I end up with a slightly uncomfortable left-handed glove on my right hand. But hey, it only takes so long to wash dishes and then I can take them off! I REALLY like your sense of humor! I’m m a new subscriber–and look forward to getting a grin (or several!) out of your posts…along with some very useful new information. Thank you so much! I have been doing this for years…lol. My family laughs and thinks I am nuts but as long as we have clean dishes it’s all good!